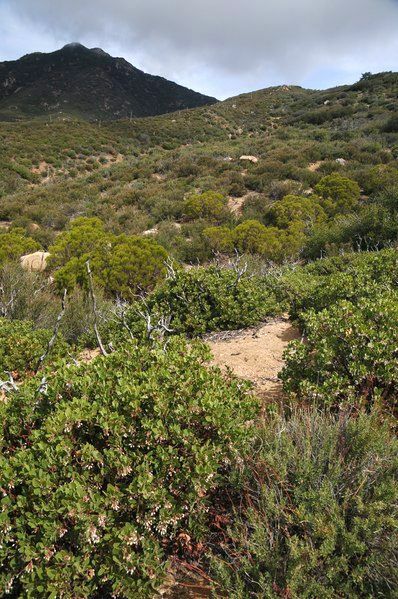 The Fobes Trail travels from the northern part of Garner Valley to the Pacific Crest Trail at the Desert Divide. 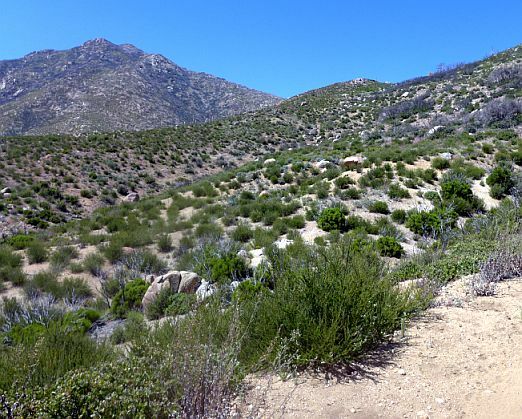 The trailhead is reached by turning north of SR74 onto a 4 mile dirt road, Fobes Ranch Road (6S05). Fobes Ranch Road is not signed like the other roads along SR74; it has only a sign on the fence by the gate, which is hard to see from SR74. The turnoff from SR74 is 6.8 miles southeast of Mountain Center just beyond mile marker 66. On Fobes Ranch Road, stay left at a fork 0.4 miles north of SR74. 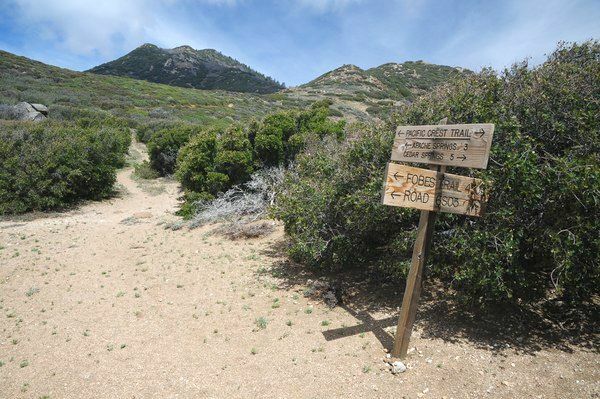 The pre-Mountain Fire (2013) trailhead was reached by driving stay right at the signed fork at mile 3.6. The pre-Mountain Fire Fobes Trailhead only had parking for ~3 vehicles, with additional parking a bit farther up the road. 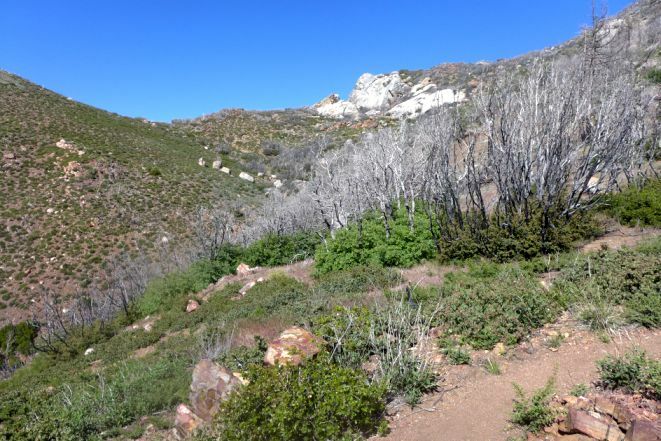 After the Mountain Fire, the Fobes Trail was closed until 2017, when it was finally reopened, 3.5 years after the fire. The new trailhead is on Fobes Ranch Road at mile 3.6. The trail now traverses the 0.4 mile of the former road at the fork. It soon becomes obvious why the road was closed and converted to the trail; the road is essentially gone at two stream crossings. See Hike 80 in Robinson and Harris, San Bernardino Mountain Trails, sixth edition, January 2006, p. 204; and Hike 48 in Ferranti and Koenig, 100 Great Hikes in and near Palm Springs, 2000, p. 103. Due to the changes in the trail, we have removed the plant trail guide formerly on this page, and present the plant list in traditional family order (link to be added soon). The rest of this page will be updated when the family order plant list is online. This guide is mainly the result of two trips in March and April 2007 only to mile 1.12, along with a trip in July 2009 that extended the guide to the top of the trail without much botanizing on the lower part of the trail. Numbers not yet supplied for the last two trips on the trail. The fieldwork on 3/18/07 and 4/4/07 was only to mile 1.12. 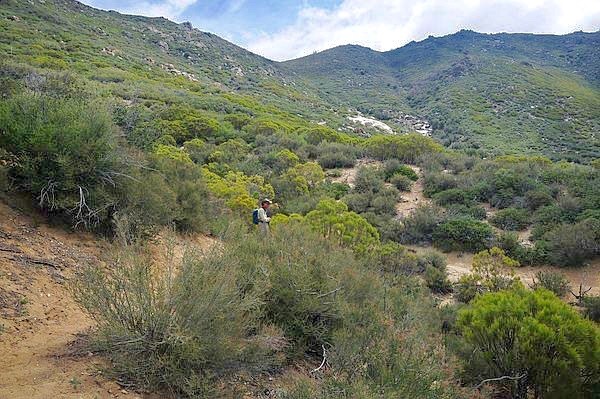 The fieldwork on 7/2/09 concentrated primarily on mile 1.12 to the top of the trail. We thank an anonymous person for help with the fieldwork on 3/18/07, and another anonymous person for help on 7/2/09, and Mike Crouse for help with the fieldwork on 7/2/09. 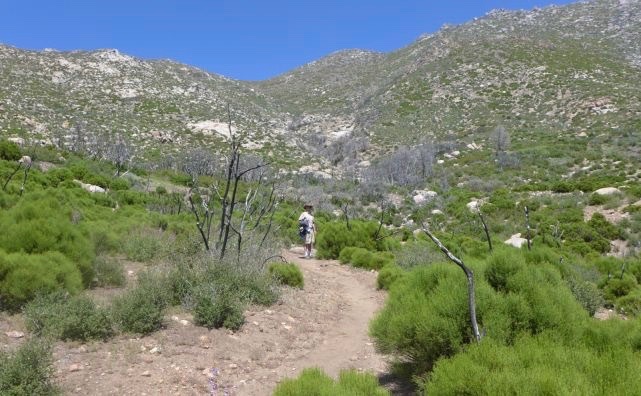 Fortuitously, Mena Schmid took a number of photographs from this trail on 2 May 2009 before the 2013 Mountain Fire. 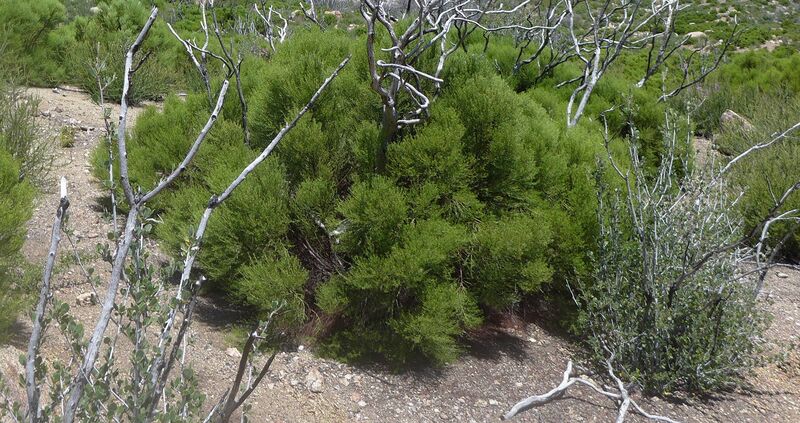 Tom Chester, RT Hawke, Shaun Hawke, Keir Morse and Nancy Accola attempted to reproduce four of those photographs on 13 May 2017, nearly four years after the fire, in order to show how the vegetation differed before and after the fire. We didn't get an exact match for most of them, but the views are clearly the same, allowing a direct comparison of the vegetation. Mena's photographs are on the left below, reproduced here by her permission; Tom's photographs are on the right. Note that the lighting conditions were very different between the two trips, partly cloudy in 2009 and sunny in 2017. Jane Strong closely studied the above photographs, and noticed the changes listed below, in italics. The other comments have been added by Tom Chester. The trail is wider post-fire. 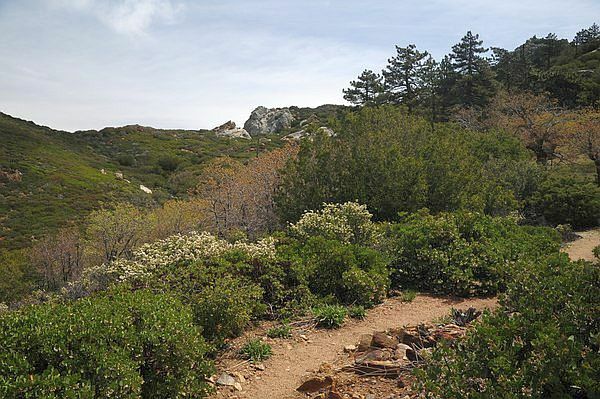 This is almost surely due to brush-clearing and dead vegetation clearing done to reopen the trail, as well as the fire pruning back some of the vegetation. In the first set of photographs above, the taller plants burned and left blackened branches, with little new growth apparent at the base. 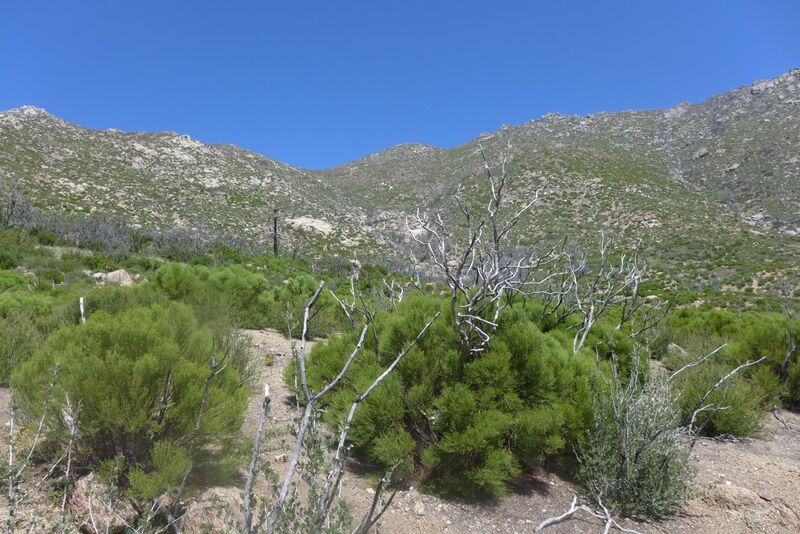 The taller plants are mountain mahogany, Cercocarpus betuloides, which are growing back much more sparsely than the other plants. See closer pix of the vegetation and a close look at the new branches of the Cercocarpus at the bottom of this picture. The shorter shrubs recovered well and look about the same. Those are red shanks. We were all surprised in the field, comparing what we saw to Mena's photograph, that they looked so similar! That could be explained if there was a burn not too long before Mena's photograph. In the third set of photographs above, the trees and tall bushes took a big hit and have not recovered. The trees / large shrubs on the left, just leafing out in Mena's pix, are black oak, Quercus kelloggii, which indeed is only slowly growing back to their former height. 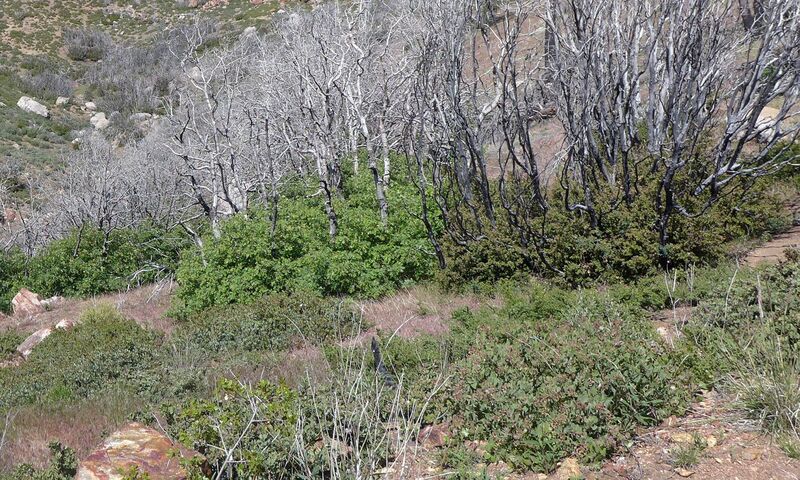 The leafy tree / shrub on the right is probably canyon live oak, Quercus chrysolepis. The flowering shrubs in Mena's photograph were Arctostaphylos glandulosa and, probably, Ceanothus perplexans. There were abundant very young plants of the ceanothus in 2017, so it will be a while before they get as big as they were in Mena's pix. The A. glandulosa plants now are short. Note that the years since the burn have mostly been drought years, except for the 2016-2017 season, so the recovery of the plants is probably behind what would have happened with more-normal rainfall. See a closer view of those plants. There are many dead unburned branches in Mena’s pictures that are gone in the post-fire pictures. There must have been a lot of fuel on the ground. Mena Schmid noticed there were dead branches in the middle of the bushes in her photographs which were gone in the post-fire photographs, which had the new set of skeletons from the fire. Copyright © 2003-2017 by Tom Chester, Dave Stith, James Dillane, Keir Morse, Nancy Accola, RT Hawke, Shaun Hawke, and Erik Blume.